The beautiful Santa Claus story on radio waves started by Finland's radio amateurs (OH9SCL in 1986 and later the OF9X team) has been taken over in recent years by different colleagues from several European countries. In this context, the initiator of the Romanian team, Sorin YO2MSB, put his traditional Santa clothes, a white beard, and three years ago he went looking for the elves eager for such a radio event. And they rushed to say "yes" to the call of Santa and began to prepare their necessary radio equipment. Therefore, on December 01st, 2016, the first calls with YP-XMAS were heard in frequencies. Today, in 2018, we are preparing for the largest team with activators in all the districts of YO. The authorization for these special callsigns has already been issued by The Romanian Radio Authority ANCOM, and based on it the team will use as many bands and operating modes as possible. It's up to propagation to be heard everywhere and throughout the whole month of December. We want to have QSOs as diverse as in SSB, CW, AM, FM, but also in digital modes. We will not avoid neither the VHF/UHF frequencies if our activators will have the necessary equipment. Even the "ragchewing" on the repeaters is welcome with these special callsigns, because YP-XMAS is not a contest with restrictive rules. We hope for massive postings on clusters so we can easily be found. It is important for us to feel good together on frequencies and we will try to create more than common "59-73" QSO’s. And for the most brave of our correspondents we are preparing some small surprises. For those who will get in touch with at least 3 different YP-XMAS callsigns we will be able to issue an electronic award directly from Santa Claus, it is necessary just to send an e-mail request with the log extract. And for those who collect QSL’s on paper, we have such memories prepared to send. 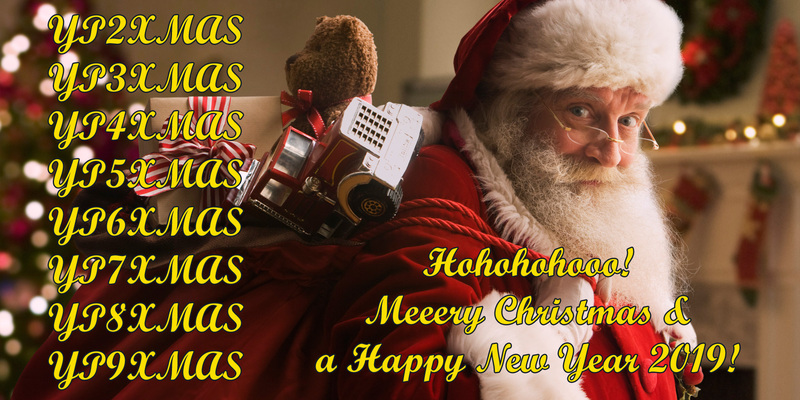 So, in December 2018, we invite you to call us with the specific "Hohohooo!" and the traditional "Merry Christmas!" and "A Happy New Year! ".